The DIY alternative to print fabrics with light. Lumi is a new DIY alternative to screen printing.The process works on cotton, linen, silk, rayon, canvas, and any other natural & absorbent fiber. Once finished, your print is permanent and can be machine washed without fading. 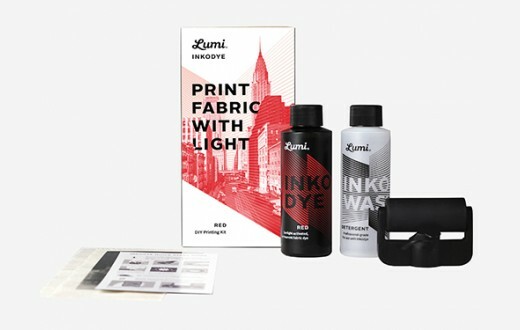 Lumi Red Inkodye Kit is ideal for beginners or anyone planning a small set of Lumi projects. Makes about 4 prints at 12x12 inches or 30x30cm each.